Secretary of State Condaleeza Rice brokered a defensive missile shield system with Poland in reaction to Russia's ongoing conflict Georgia, angering Russian officials and increasing regional tensions. 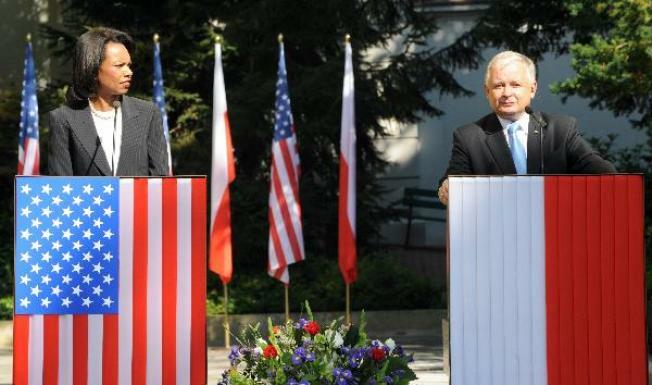 Rice and Polish President Lech Kaczynski announced the formalized missile defense deal at a ceremony yesterday. The arrangement calls for the U.S. to install 10 interceptor missile installations just over 100 miles from the Russian border. The Russian government reacted angrily and warned that it could prompt an attack on the former member of the Warsaw Pact alliance. “This is a system that is defensive and is not aimed at anyone,” Rice said. “This is an agreement that will establish a missile defense site ... that will help us to deal with the new threats of the 21st century of a long-range missile threats from countries like Iran or from North Korea,” the defense Secretary was quoted as saying at MSNBC. The bellicose rhetoric emanating from the Kremlin is worrying some analysts that the U.S. could soon be facing a replay of 1962's Cuban Missile Crisis, in which the former Soviet Union attempted to install ballistic nuclear missiles just 40 miles offshore the coast of Florida. Wall Street analyst and Internet commentator Mark Leibovit said that financial markets could be getting the jitters at the prospect of a new Cold War. The rhetoric between America and Russia is getting downright scary," he says. "The Russians seem to have gone crazy. Are we in for a replay of the Cuban missile crisis? Who knows what they'll do next? They're already threatening to nuke Poland." An opinion piece in The International Herald Tribune posits that the United States completely botched the political handling of the Georgian situation––potentially encouraging the Georgian government to make incursions into South Ossettia and then backing the former Soviet member nation without question. While there is a tentative ceasefire between the Georgians and the Russians and food aid is beginning to arrive in the outmatched former country, the Russians don't appear to be eager to execute an exit strategy. They're currently solidifying their defenses in South Ossettia and establishing checkpoints, in what appears to be an expansion of its borders.